The shallow, protected waters of the Chesapeake Bay and it’s tributaries are excellent for canoeing and kayaking. Paddling in these small boats has become an increasingly popular activity in the Chesapeake Bay region. Canoes and Kayaks can be launched from boat ramps, beaches, and other shoreline areas. These quite, shallow draft craft allow you to get up close to nature and explore areas inaccessible to larger boats. Several water trails have been established around the Bay for use by canoes and kayaks. These trails guide you from point to point along mostly protected waterways. 60 miles of trail on Maryland’s Eastern Shore. Runs through Virginia Beach and Norfolk. System of five separate water trails spanning Gloucester County, VA.
Several trails of different lengths. Located near Crisfield, MD. 90 miles of trails on Virginia’s western shore of the Chesapeake Bay. Nanticoke River water trail on the Delmarva Peninsula. 100 miles of trails along Virginia and Maryland shorelines with lots of stops at historic sites. 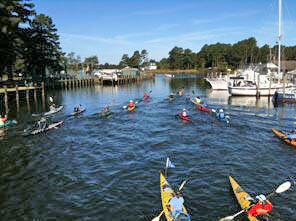 Offers activities for kayakers within the Chesapeake Bay region. Day Trips on the Tidal Tributaries and Coastlines of the Western and Eastern Shore. By Michael Savario and Andrea Nolan. This first and only sea kayaking guide to the Chesapeake Bay region offers information and guidance for 30 paddling trips. Trip descriptions include important information on put-ins and take-outs, winds, and currents, equipment, paddling techniques, and safety issues. The authors enliven their instruction with informative sidebars on topics such as salt marsh ecology, wildlife, and social and maritime history.